Hi All, I’m Chelsea, and as the temperature drops this season, I find myself increasingly less apt to go outside. Not only are the trees becoming barren, but I’m from SoCal and I only own so many sweaters… Which brings me to my question: What can I do to get warmer or make the city I’m living in a little warmer??? There are multiple answers to this question… I could buy a coat, for one. I could get those awesome hand and sock warmers that only last for 15 minutes (but you know it’s the best 15 minutes of your life), I could try to invent a portable space heater (that is not a hand or sock warmer). But no- the best answer to this question is ….drumroll…. 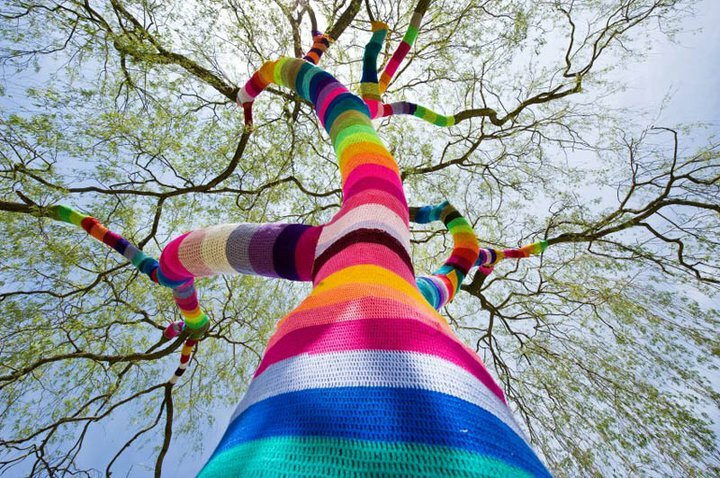 yarn bombing. Ask not what you’re country can knit for you, but what you can knit for your country. That’s right, I’m going there. Guerilla crocheting pretty much combines everything warm and cozy about winter: decorations and sweaters. 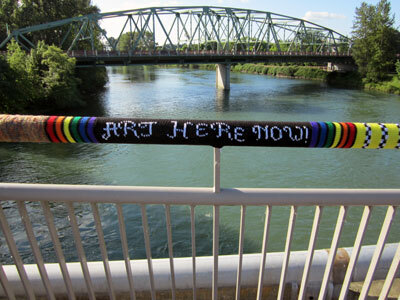 Yes, I know…yarn and knitting seem to clash with the idea of public rebellion, but for a couple of years now, yarn bombing and guerilla knitting have become viable forms of street art. 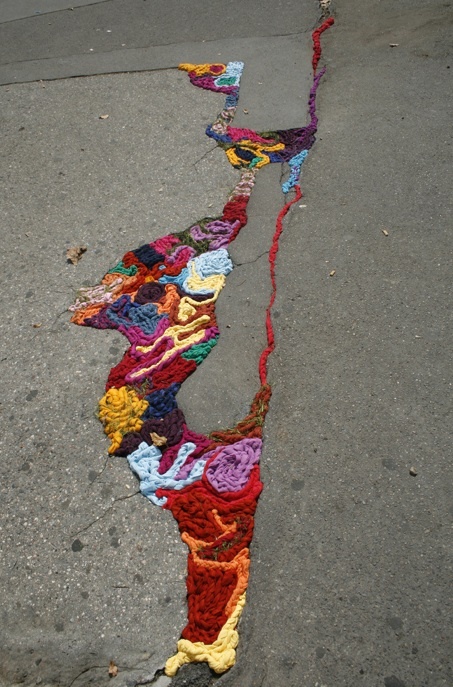 While some artists make a sort of stocking or wrap for poles and street lamps, others like, Juliana Santacruz Herrera, simply arrange yarn into colorful shapes in the cracks of pavement or on public walls (pictured below). 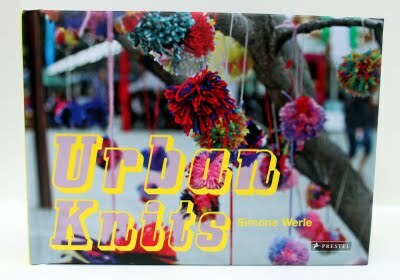 If you’re still on the fence about how awesome guerrilla crocheting is, come in to the store and check out a book we carry, Urban Knits (pictured below). 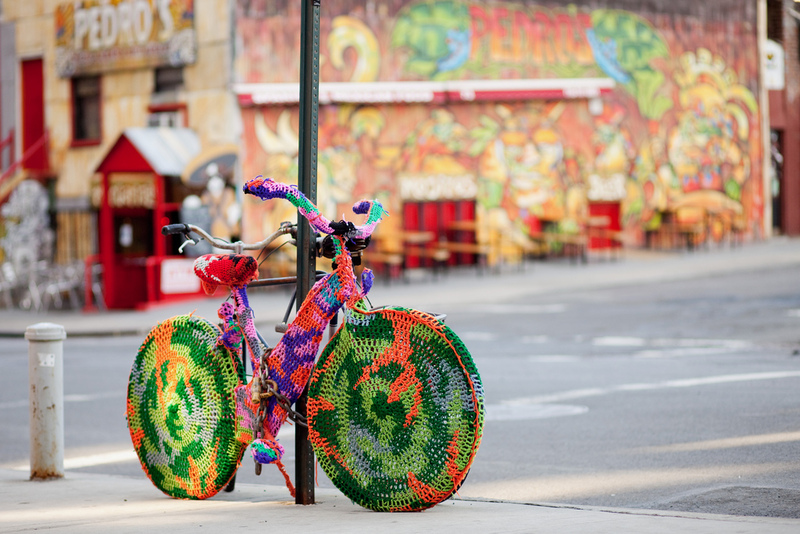 Bonus for you: some other blogs dedicated to yarn bombing = Knitty Graffity and YarnBombing. As the weather gets colder this holiday season, think about cozying up with something knitted or… think about making this city a little warmer, and start dropping them yarn bombs y’all! This entry was posted in Books and tagged urban knit, yarn bomb by admin. Bookmark the permalink.